Our qualified technicians have wide experience of prosthetic techniques including the Ivoclar biofunctional prosthetics system. This means that our dentures are more in harmony and more tolerated with a patient’s mouth giving a more natural looking set of teeth. 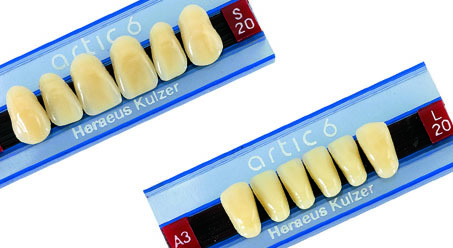 Artic 6 is a multilayered, life-like, aesthetically pleasing anterior tooth. This anatomically shaped tooth permits perfect adaptation to existing dentition and to complete dentures. 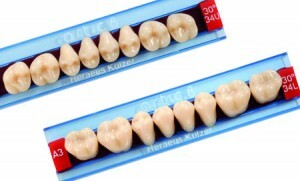 It is available in 16 shades A1-D4 and 33 anterior moulds. With its high degree of translucency in the incisal and approximal regions, it offers dentists and their patients anterior teeth with an appearance guaranteed to match natural dentition under all ambient or artificial lighting conditions. The Artic 8 posterior tooth is available in 16 posterior moulds that provide a superior physiological function, accurate intercuspal relationship, perfect occlusion and an even distribution of the masticatory load. The unique hollow neck improves bonding to the denture base material. 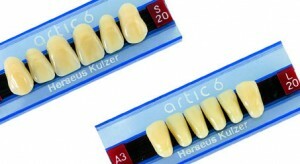 Artic 8 guarantees fast and easy laboratory set up and first time fit in the patient’s mouth. However, Dentists may even specify which make of teeth they require for private clients.